The pinwheel is the Rodney Dangerfield motif among those found on cut glass of the American Brilliant Period. The reason why this motif gets so little respect is not difficult to discover. 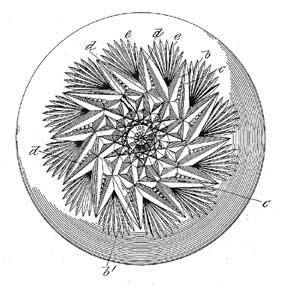 In spite of the quotation above, Dorothy Daniel is quick to point out that “the pinwheel is identified by connoisseurs with the decline of Brilliant period design.” And she continues: “Most of the pieces with the pinwheel as part of the pattern are overornamented, clumsy in shape, and lacking in definite design.” Although overornamentation and clumsy shapes have seldom been inhibiting factors for many collectors of brilliant cut glass, probably even the least discriminating collector hesitates when confronted with an item that is “lacking in definite design.” This latter point is underscored by the paucity of patented patterns from this period (1900-1920) that contain the pinwheel motif. An additional factor, pointed out by Daniel but often ignored by present-day collectors, is her observation that “the pinwheel and the pressed (i.e., “figured”) blank were popular at the same time, the former with customers, the latter with dealers.” Today, both customers and dealers are leary of exchanging money for glassware cut on “figured” blanks. When he was a dealer, the writer avoided purchasing patterns that contain the pinwheel motif because such items are difficult to sell. The practical economics of the marketplace rule! Today, as in Daniel’s world of 1950, most dealers and collectors follow her suggestion: “Never pay as much for any Pinwheel cutting as you would for the earlier hob-star patterns such as the Kimberly, Florence, or Chrysanthemum” (all of which, not incidentally, are patented patterns). It must be noted that all pinwheels are not created equal, as illustrated by the examples in this file. The writer has yet to come across an exact example of the patented design, above left, which is generally acknowledged to be the first pinwheel and is obviously a design of quality. This is Patrick H. Healy’s patent (no. 30,267) of 28 Feb 1899. The motif’s vanes are made by pairs of miter cuts surrounding a hobstar that has a single star on its tiny hobnail. The fans between the vanes are considered part of the design for all pinwheels, but the beading is an elaboration. The closest approximation to Healy’s design that has been found to date is the so-called “tornado pinwheel,” above right. Note the simplifications, including the use of a Brunswick star on the pinwheel’s “hob.” This example is believed to have been cut between 1904 and 1909 at the Quaker City Cut Glass Company, Philadelphia. The third example of a pinwheel, the one at the right, is typical of what one finds on glass of average quality cut during the early years of the twentieth century. This particular example has been taken from Swan 1986 (p. 297) and can be dated c1913. The collector will find several variations of Healy’s patent, all of which can be called pinwheels; some of them are worth collecting. 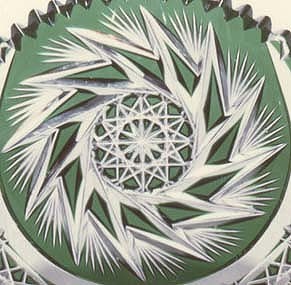 For example, imaginative pinwheels are found in the Arcadia and Dawson patterns that were cut by Taylor Brothers and Company of Philadelphia. Although alternate names for this motif are sometimes heard — such as buzzsaw and whirling star — the name pinwheel is the one that is more widely used. It is safe to say that every collection should contain at least one example of the pinwheel motif. It is, after all, probably the only American cut-glass motif that is 100% American!